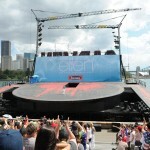 My five year dream has finally come true, although sadly I wasn’t there to experience it (and I admit I got a bit teary about not being there yesterday because it was my dream and I wasn’t part of it), Ellen came to Sydney and did a show and although I wasn’t there in person, I was there in spirit and I’m so glad she finally arrived Down Under and many Aussies got to experience her joy first hand. 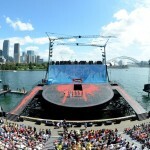 The one-hour show was filmed on a massive massive outdoor stage outside the Royal Botanic Gardens so didn’t have that “Ellen” personal feel to it which was rather strange to see her so dwarfed by the stage of the Opera Australia production set for Carmen. 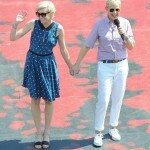 Ellen and Portia arrived by boat – the only way to arrive in style is via Sydney Harbour – and of course VIP guest Russell Crowe arrived by boat too! 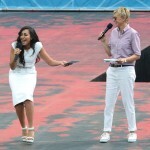 Jessica Mauboy was also a special guest and had some fun on stage with Ellen helping out with the Male Model competition. 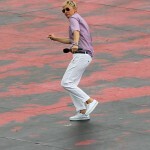 And it looks like Ellen busted some of her famous dance moves. 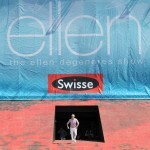 The Ellen Show‘s official underwear model, Mike, was tasked to help find a local equivalent, where the crowd saw five buff blokes from around the country competing for her affections. Decked out in fluoro pink briefs, the beefcakes were quizzed by Ellen in a male version of the Miss Australia pageant – dumb questions included. We can’t have an Ellen show without one of her infamous games and it was her favourite (and mine), “Know or Go” … and we also couldn’t miss out on her signature style of giving away some money to those that need it. Sydney couple Maddie and Patrick were gifted with $10,000 from Swisse to help pay off their student loans via the Gold Digger money box. The Daily Telegraph reports that the fast-paced production allowed little time for Ellen to do her usual kind of crowd bonding she’s renowned for which is a shame if that’s true but regardless Ellen finally came to Sydney and everyone looks like they had an awesome time, and her trademark fun and friviolity were on hand … up next Melbourne’s turn to enjoy their turn in the Ellen spotlight. And as always, don’t forget to check out our Magazine of our version of Ellen’s trip around Australia, seriously it’s a hoot!